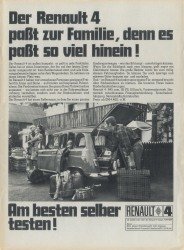 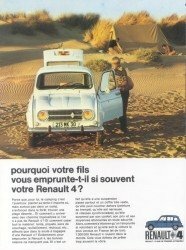 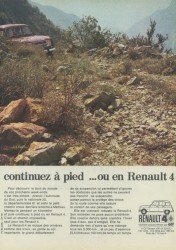 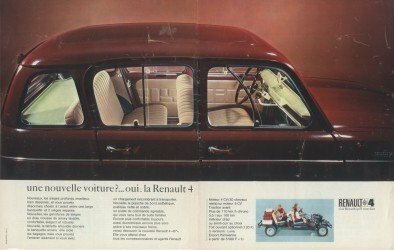 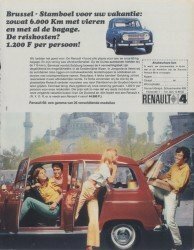 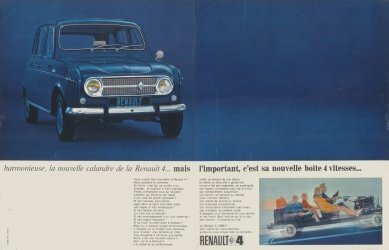 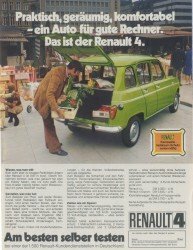 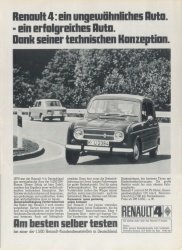 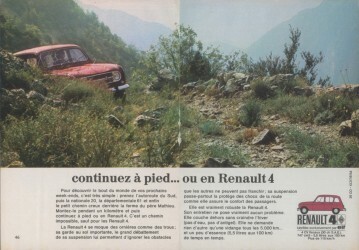 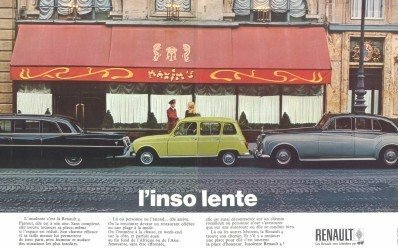 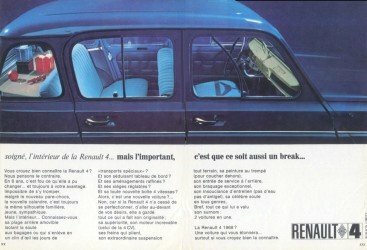 This page shows a number of R4 magazine advertisements published by Renault from the period 1968-1974, all with the chrome grille encompassing both headlights. 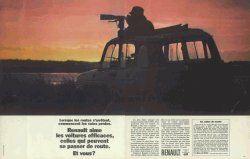 With the introduction of the 1968 model a large number of ads saw the light. 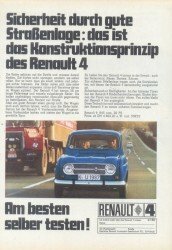 Note that 1968 was to become the year with the highest production of berlines: 336,604 were built. 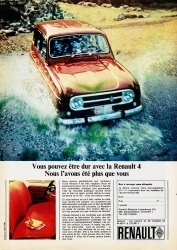 The shades of the photos shown below are represented in the red and blue brochures. 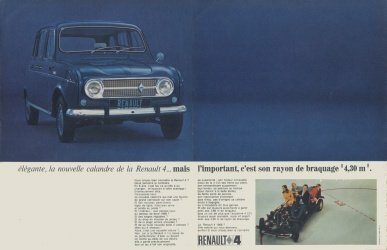 (note that the red brochure is from 1967, the year when the new dashboard was introduced, whereas the new grille was introduced in 1968, with the blue brochure; I put both red ads in this section because they match the two blue ones from 1968 so nicely). 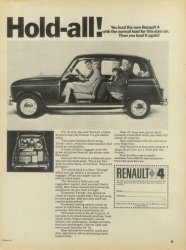 Whereas in 1967 only the dash is new, the 1968 ads mention the new gearbox, grille and steering radius. 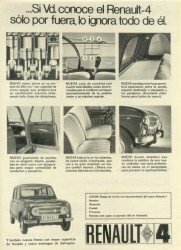 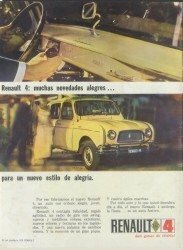 In Argentina, the 1967/1968 changes are reflected in two ads, one reading 'Muchas novedades alegres', meaning many pleasant novelties. 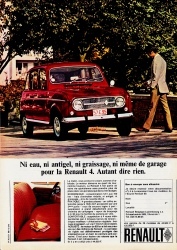 Note that the acceleration poker is the pear-shaped 1968 type, whereas the grille is still the pre-1968 type. 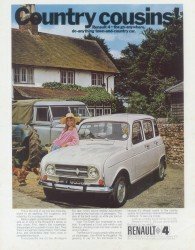 A nice series from the UK, most already published in 1967 and 1968, with some catchy titles taken from the UK brochure of the same year. 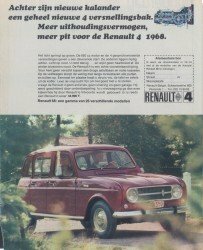 The Goldmine and Hold-all models still have the old bumpers, whereas the others have the bumper that was newly introduced in 1968. 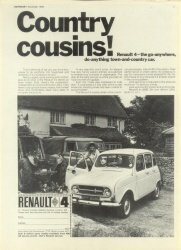 Apparently, the british couldn't resists sticking in their own Landrover on the Country Cousins ad.. 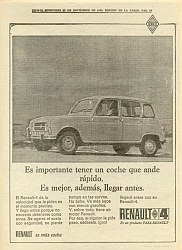 Although in Spain the R4 was only introduced in 1964, the new model is also introduced in 1968. 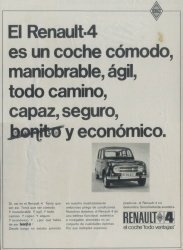 The ad on the right proves that not only the English can be tongue-in-cheek: it claims that the R4 is all but beautiful. 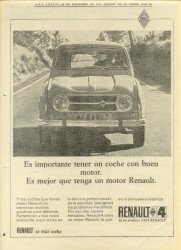 Unfortunately of poor quality but very nice indeed, are three from 1969 issues of the Spanish newspaper ABC. 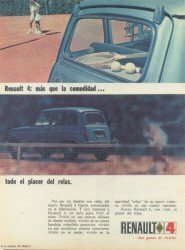 The tagline FASA uses is 'es más coche', meaning 'more car'. 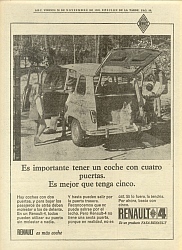 The main text reads, from left to right, 'It is important to have a car with a good engine. 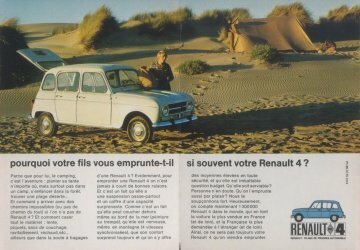 It is more important that it has a Renault motor', 'It is important to have a car with four doors. 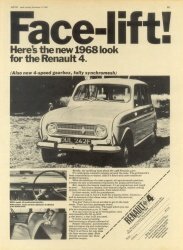 It is more important that it has five' and 'It is important to have a car that runs fast. 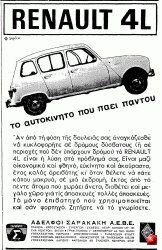 It is more important, furthermore, to arrive earlier'. 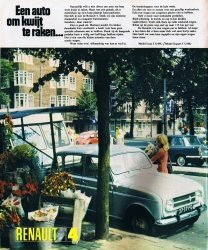 A couple from the Netherlands, about 1968, showing very nice photographs taken in Amsterdam. 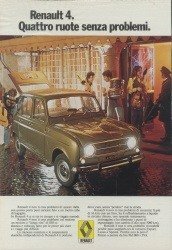 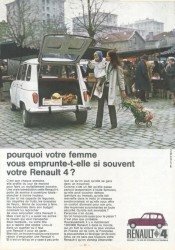 The taglines are 'The emancipated shopping cart', 'The spacious Renault 4' and 'A car to lose'. 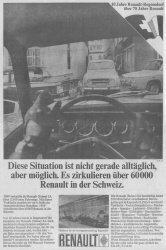 The current looks of all three locations are shown in the Where Was It section. 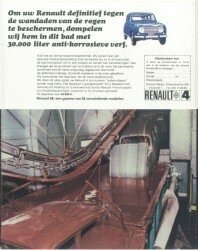 - 'To protect your R4 against the outrages of rain definitively, we submerge it into this bath filled with 30,000 liters anti-corrosive paint'. 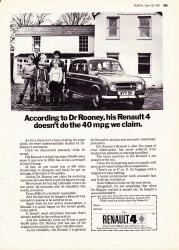 From 1970 and 1973 four very tongue-in-cheek ones from the UK, about the Marquis of Bath, Dr. Rooney and Mr. Fairhurst. 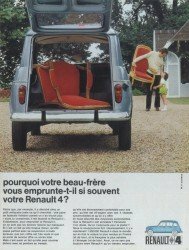 Who said R4 was middle class only? 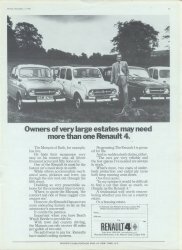 The Marquis of Bath has five. 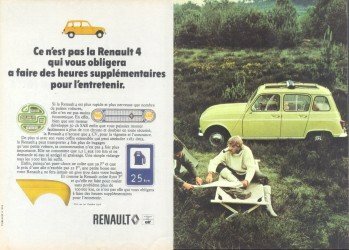 Dr. Rooney informed Renault about an error in their advertisements: according to him, the Renault doesn't do 40 mpg but at least 50. 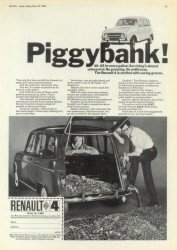 And he is unlikely to have his figures wrong because he can claim for motoring expenses. 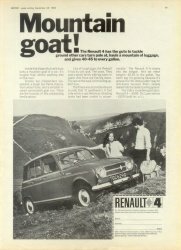 Mr. Fairhurst was lucky to be able to snap up Father Clements Renault 4 (who, actually, exchanged his Renault 4 for another Renault). 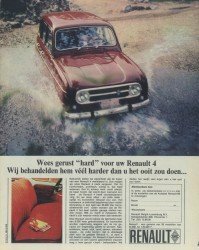 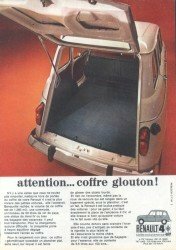 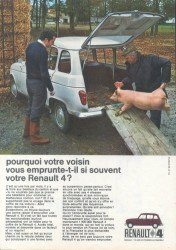 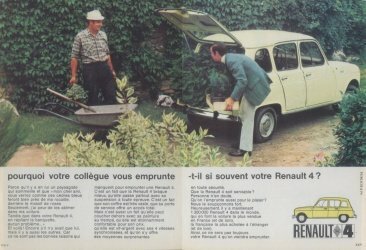 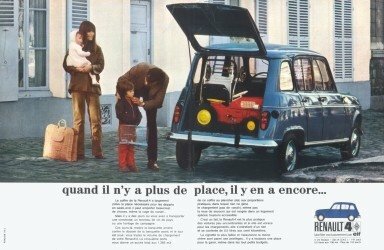 On the right probably the least flattering one I know of, titled 'You can't mistake a Renault 4 for anything else', probably meant to emphasize its carrying capacity. 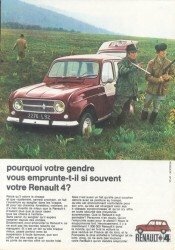 Just around the same time, about 1969-1971, another nice series. 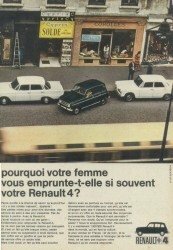 The tagline has become 'Pourquoi votre fils / femme / beau-frere / voisin / gendre vous emprunte-t-il si souvent votre R4? 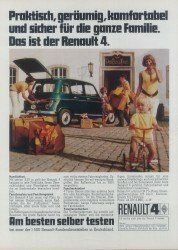 (Why does your child / wife / brother-in-law / neighbour / son-in-law / collegue borrow your R4 so often?). 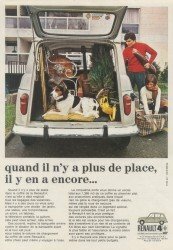 Apparently, to go to the market or shopping, and move pigs and furniture. 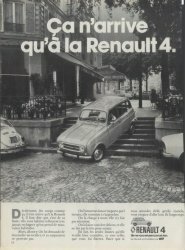 The Renault slogan is now '70 ans de progrès automobile' (70 years of automobile progress). 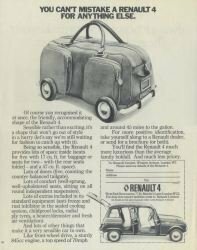 The R4 is presented as the ultimate handy car, useful for a 1000 applications. 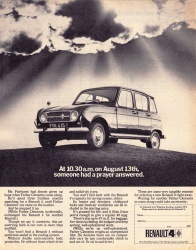 The next series of advertisement comes from about 1971- 1972. 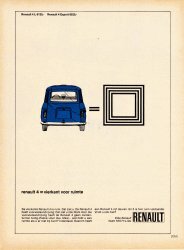 The taglines are, in order, 'When there is no more space left, there's still some' (1970), 'Attention... greedy boot', 'Hire two motorcycles... or buy a Renault 4' (1971 or 1972), 'Continue on foot... or in a Renault 4'. 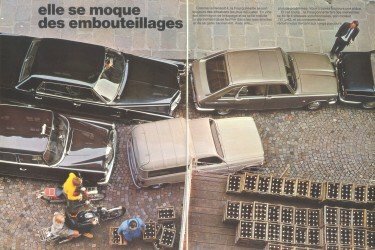 The photo 'Elle se moque des embouteillages' is not an ad but comes from the 1971 Fourgonnette brochure. 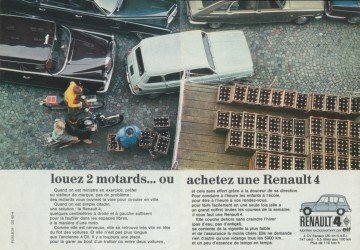 It is strikingly similar to the 'Louez deux motards' (which is also present in the 1971 Berline brochure, but with different text: 'une traficante qui s'en sort toujours'). 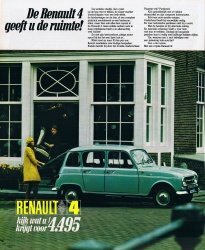 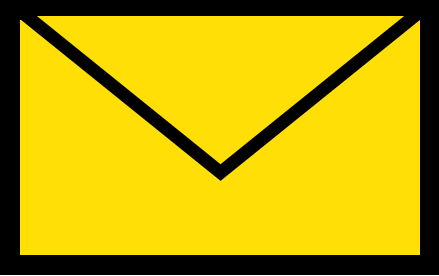 The last one is from the Netherlands, 1972, and emphasizes the squareness of the R4, aiming at space only. 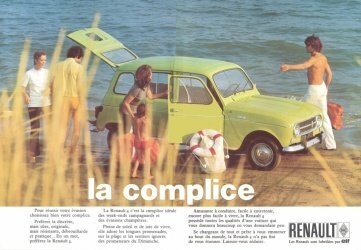 'La Complice' and 'L'insolente' are from the 1972 brochure (but the ads are from 1970 and 1971). 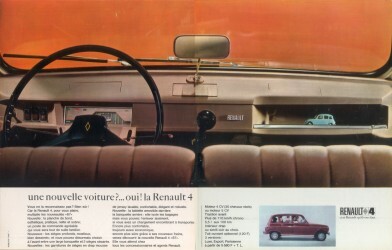 Similar to the 1973 brochure, the model pictured is a vey nice green. 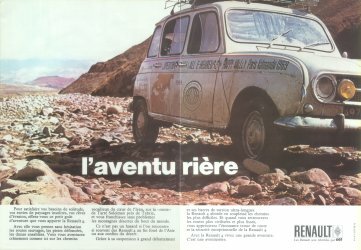 'L'aventurière' (the adventurer) shows one of the cars that was used in the 'Les Routes du Monde' programme, where R4s would be driven from any French town to remote places around the world, like, in this case, from Paris ('Vallée heureuse') to Katmandu (Happy valley) (nice footage about a similar expedition to Afghanistan in 1968 can be found on Youtube). 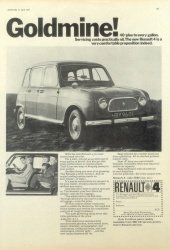 One of my favourites is from the 1973 brochure. 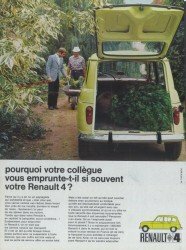 It shows a green R4 somewhere in the field with its supercool owner in front: fisher cap, beard, pipe (ceci est une pipe, vraiment!) 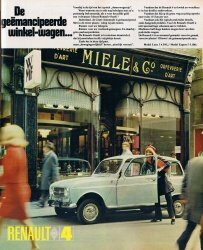 and long leather boots. 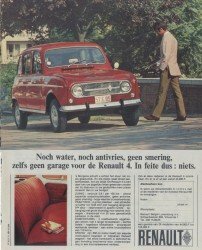 Check out the other appearances of these dudes in the People section. 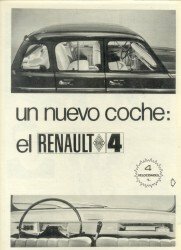 Note that this 1973 model ad already shows the logo that was to be introduced on the 1974 model. From a 1973 magazine comes a series of three ads showing the 1974 logo on the car. 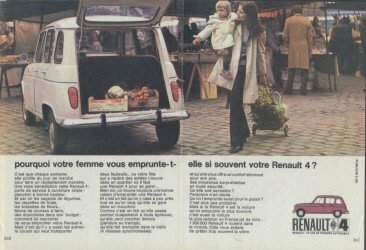 It carries the slogan 'Elle ne vous refusera jamais rien', which can also be heard in the 1973 TV commercial. 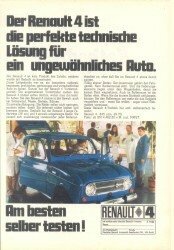 Some more from Germany, a series carrying the slogan 'am besten selber testen', or 'best tested by yourself'. 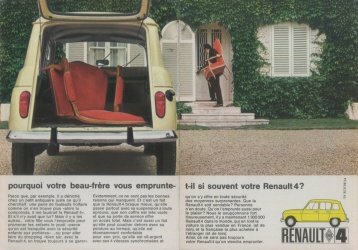 The age is about 71-72, perhaps 73-74. 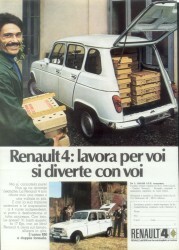 Those Italian ones are from about 1973 and 1974. 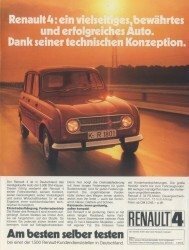 The slogans read 'Works for you, enjoys itself with you' and 'Four wheels without problems'. 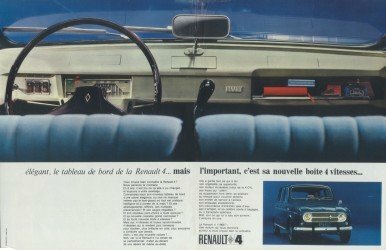 Continue to the 1975-1993 section.